Matthew Houghton was born in Birmingham in 1788. Henry Houghton, baptised at St Mary Magdalen Church on 3 September 1820. Matthew’s occupation is given as printer during the period the family lived in George Street. By 1823, Matthew Houghton had moved to St Clement’s, where he had three more children baptised. 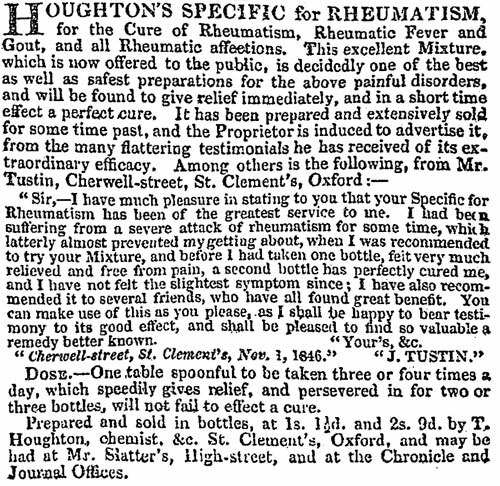 Houghton is described in the St Clement’s baptismal registers as a grocer in 1823 and 1826, but as a druggist in 1834, and indeed he is shown as a “Chemist & Druggist” in St Clement’s in Pigot’s Directory for 1830; and he is described as a chemist of High Street, St Clement’s, when he was elected one of the Guardians of Headington Union in March 1844. By 1839 Matthew Houghton was in partnership with his son Thomas in St Clement’s Street, and the business is described as Houghton & Son in Robson’s Commercial Directory for 1839. The 1841 census shows Matthew and Elizabeth and their teenage daughter Mary living in one household in St Clement’s High Street, and his sons Thomas (then 28) and Henry (a clerk) living in another with Thomas Hester (14) an apprentice chemist, and one servant. Matthew is described as a grocer, and Thomas as a chemist, and it appears that father and son continued to split the work in this way. Matthew Houghton died at the age of 68 and was buried at St Clement’s Church on 31 October 1856. His wife Eliza died in Caroline Street at the age of 83 and was buried at St Clement’s Church on 28 February 1864. At the time of the 1851 census, Thomas (38) and Elizabeth (34) are living with their son Henry (4) at their shop in St Clement’s. Thomas is described as a “chemist and druggist”, while his father Matthew, in a separate household in St Clement’s, is now described as a Grocer. Thomas’s brother Henry (29), a lay clerk at Magdalen College, is now living with his parents. Thomas Houghton is listed as Chymist & Druggist at 48 High Street, St Clement’s in Pigot’s Directory for 1842, at 54 High Street, St Clement’s in Slatter’s Directory for 1850; and at No. 53 in the 1861 census and in Mathieson’s 1867 directory. The Houghtons did not necessarily move shop; the street may have been renumbered. In later directories, it is obvious that the shop is next to the one on the east corner of Caroline Street. By 1867 Thomas Houghton’s chemist’s shop was also the St Clement’s Street post office. The 1861 and 1871 censuses shows the Houghton family living at 53 St Clement’s High Street. In 1861 Thomas (48), described as a Chemist & Druggist, is living with his wife Elizabeth (44) and their five surviving children. Also in the household are Thomas’s widowed mother Eliza (78), who is described as a house proprietor), plus an apprentice chemist (William Ham) and one servant. Ten years later only three children, Louisa (19), Alice (16), and Ellen (13) are at home, and the new apprentice is William J. Wilson. In 1881 Thomas Houghton’s address is given as “The Cottage”, 85 St Clement’s. Now 68, he is described as a chemist employing two assistants (one man and one boy). Two daughters, Louisa (29) and Ellen (23) are at home, and his niece Psyche Houghton (2) is at the house. Thomas Houghton died at The Cottage at the age of 74, and was buried at St Clement’s Church on 15 June 1887. In the burial register he is described as “late Rector’s Warden”. His widow Elizabeth remained at The Cottage with various members of her family until her death there at the age of 95. She was buried at St Clement’s on 2 April 1912. Until 1918, No. 53 Caroline Street is listed as “Houghton & Son, chemists, post & telegraph office”; but in 1919 it was taken over by another chemist, Herbert Oddy.